When we travel through California I am constantly amazed by how many great wine regions we have, many of which are not well known outside of California. Central California holds several Central Coast wine regions both big and small. 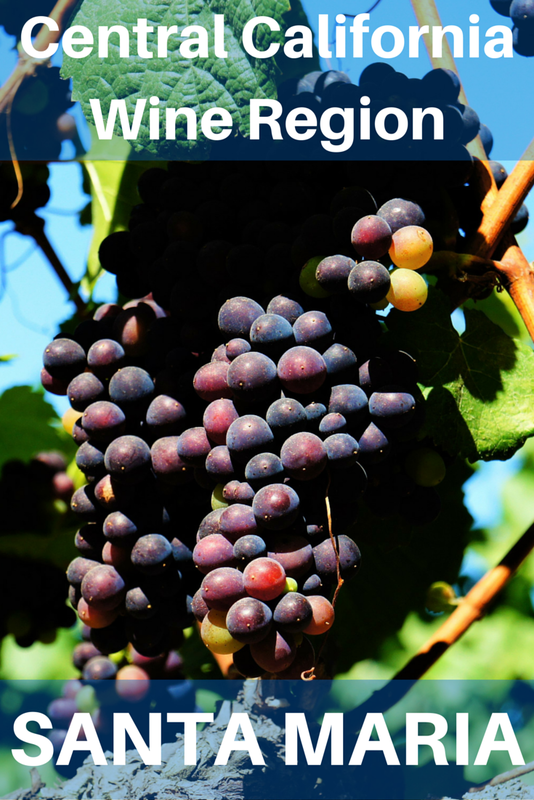 Recently we returned to Central California and went wine tasting in Santa Maria, one of the Central Coast’s smaller wine regions south of the Paso Robles wine region, to discover what kind of wine the area holds. We found cute little wine tasting rooms with personalized service and wines that are unique, delicious, and affordable. While Santa Maria is known for their Chardonnays and Pinot Noirs, we were drawn by Santa Maria’s semi-sweet whites, rosés, and unusual red varietals. Our first Santa Maria wine tasting stop was at Riverbench. The wine tasting room is in a farmhouse built in 1927 for a dairy farm. While Riverbench is one of Santa Maria’s newer wineries, as they started producing wines in 2004, Riverbench’s vineyard, which was planted in 1973, is the second oldest in Santa Barbara County. The vineyard currently has 287 planted acres. Guests can choose from the regular wine tasting menu or the sparkling wine tasting menu and either taste in the tasting room or sit outside at one of the café tables. The day we visited was perfect, warm and clear. We sat outside with our dogs and listened to a two-piece band, sipped our wine, and enjoyed the view of the vineyards. Our favorite wine at Riverbench was the 2014 Rosé of Pinot Noir. This rosé is just barely blush colored. It is acidic, bright, citrusy, and has mild flavors of rose petal. Whole Pinot Noir grape clusters are pressed, then filtered quickly, which gives the wine a very light color. As a final touch, the top of the bottle is dipped in light pink wax to let you know it holds something very special inside. Another favorite of ours was the 2014 Riesling. While sipping on our glass we could see the Riesling vines just across the way from the tasting room. The Riesling smells jammy and tastes a little like sour jelly candies. It is off-dry, tart, a little puckery, and yet also slightly sweet. Riverbench makes four chardonnays. Our favorite was the 2014 Bedrock Chardonnay which is fermented in 100% stainless steel tanks. The fact that it never touches oak allows the real taste of the Chardonnay grape to come through. Riverbench also makes a number of Pinot Noirs. Our favorite was the 2012 One Palm Pinot Noir. This is an unusual Pinot Noir, full-bodied with a thick aroma and full of flavor. The tasting room of Rancho Sisquoc Winery is in a wood cabin surrounded by trees and grass. Their logo is a picture of the San Ramon Chapel located a few hundred yards away. The winery has 350 acres of vineyards and 3,700 acres of open land perfect for cattle. The first vines were planted in 1968, the first Cabernet was bottled in 1972, and the Santa Maria tasting room was opened in 1977. Rancho Sisquoc Winery only creates 100% estate wines. Our favorite wine at Rancho Sisquoc was the 2013 Sylvaner. They are the only winery that grows the Sylvaner grape in California. In fact, the only other places it is grown in the United States is Washington and New York. Sylvaner is an Alsatian grape similar to Riesling. We were told the first owner of the winery discovered the grape when marching with General Patton. The Sylvaner has a taste of apple and is very slightly sweet. At $14 a bottle, my only regret was not buying more than two bottles. Our other favorite wine at Rancho Sisquoc was the 2012 Tre Vini. This is a super Tuscan style blend of Sangiovese, Petit Verdot, and Petite Sirah. It is so good it won gold at the New World International Wine Competition and also at the San Francisco Chronicle Wine Competition. Another star is the 2012 Cabernet Sauvignon, which is made with grapes from the oldest of Rancho Sisquoc’s vines. The Cabernet is blended with 7% Merlot and 2% Cabernet Franc and is aged for 16 months in French, American, and Hungarian oak barrels. The wine is acidic and will store well. Kenneth Volk is a bit of a legend in the Central Coast. In 1977, while he was a Fruit Science student at Cal Poly State University at San Luis Obispo, he made his first wine with a trash can, a baseball bat, and grapes given to him by a vineyard student. It was at this time he realized wine was his calling. His first job was at Edna Valley Vineyard and he knew at the time that the Central Coast was eventually going to rival wines from popular California wine regions and elsewhere in the world. In 1981, he started the Wild Horse Winery which grew to be huge and was eventually sold to Peak Wines, a Jim Beam brand. In 2004, he started Kenneth Volk Vineyards and released its first wine in 2006. He used to grow some grapes on 200 acres, but now sources everything from other vineyards. His long history and contacts in the wine making industry enable him to have his pick of some of the best grapes of the Central Coast. Even though the vineyards are not his, he is very hands-on in the farming process and participates in the decision-making. What makes Kenneth Volk Vineyards’ wines unique from others in the Santa Maria Valley is Volk’s use of heirloom varietals, grapes that are both old and rare in contemporary winemaking. The 2014 Malvasia Bianca from San Bernabe Vineyard in Monterey is a dry white heirloom wine that has a tart beginning and a floral aroma. Another white heirloom wine is the 2012 Verdelho from Pomar Junction Vineyard. The Verdelho has a citrusy aroma and flavor. One of our favorite heirloom wines was the 2011 Mourvedre from Enz Vineyard in Lime Kiln Valley. While Mourvedre is a red wine usually used for blending, Volk thinks it does well on its own. The vines have been producing grapes for over 80 years. The wine had the flavor of cranberry. Another favorite of ours was the 2012 Negrette from Calleri Vineyard in San Benito County. The Negrette has a deep purple color, almost like grape juice. When we drove up to Cottonwood Canyon Winery we were greeted by a bright orange two-story tasting room surrounded by green lawns with vineyards down the hill. Cottonwood is a destination winery with an outdoor amphitheater where bands play on Friday nights while guest enjoy wines by the glass or the bottle. Another unique feature is Cottonwood’s wine cave which can be toured as part of your wine tasting. When the Beko family purchased the property in 1988, it was planted with 46 acres of Chardonnay vines that were 15 years old. The estate is now 78 acres and specializes in Chardonnay, Syrah, and Pinot Noir. Rose bushes grow at the end of each row and are used as an indication of the health of the vines. At Cottonwood they like to pair wine tastings with food, so our tasting started with the 2012 Chardonnay paired with their homemade pickled asparagus. This was my favorite Chardonnay of the weekend. It was crisp and clean and topped with the controversial screw top. We tasted another Chardonnay, a Rosé, and a Pinot Noir before heading outside and down the hill via a few flights of stairs to visit the wine cave. Outside of the wine cave I was surprised to see the fermentation tanks outside exposed to the elements. To my recollection, I have never visited a winery with fermentation tanks outside. They are thickly covered by an insulating material which helps keep the contents of the tanks at a constant 62 degrees. I was also surprised to learn the winery doesn’t have their own bottling area, but rather hires bottling trucks that come out to the winery at bottling time. The sorting of the grapes also occurs right in the vineyards. We entered the cool, manmade cave to find tunnels full of wine barrels filled with aging wine. Cottonwood’s unofficial motto is, “We do the aging so you don’t have to” which means your wine is ready to drink as soon as you get it home. We enjoyed a barrel tasting of 2014 Syrah which still had strong tannins and a verdant vegetable flavor. We then headed back up to the tasting room for a taste of the aged 2011 Syrah. During our tour we learned a new wine making term, malolactic fermentation. Malolactic fermentation is a process where tart malic acid is converted to softer lactic acid. Green apple flavors are on the malo end of the spectrum and buttery flavors are on the lactic side. As an example, the 2012 Chardonnay I preferred was 60-70% malolactic complete, which is why it was more crisp than buttery. We visited four of Santa Maria’s wineries during our Central California weekend getaway, but there are over 20 wineries in Santa Maria from which to choose, not to mention more in surrounding areas. The wineries are in close proximity to one another, most on or near Foxen Canyon Road. The four we visited were within a 10-mile radius of each other. An added bonus is many of Santa Maria’s wineries, including the four we visited, are dog friendly in case you’re traveling with your pets.